There are many places around Idaho Falls to go and visit. As you think of places you want to visit, I’m here at the Group Real Estate to let you know the many places to visit. We have a lot of surrounding areas that lend themselves as great places to go visit. One of these is a place called Bear World. It’s only 20 minutes north of Idaho Falls, just after Rigby. It is located in between Rexburg and Rigby. Now, I have talked to you about the zoo in Pocatello, a place where you get to see wildlife as the animals, as opposed to what you see at a “normal” zoo. You will see bears, cougars and rock chucks. If you were to choose, and had the option, make sure that you choose Bear World. Now Bear World is a bit more expensive, compared to the Pocatello wildlife zoo. Adults can get into Zoo Idaho in Pocatello for only $5.75. Now, Bear World is a bit more pricey, as it is $20 to get in. Children are half the price. If you would like to go in, in a full carload (max capacity is 7 people), you can pay $90. 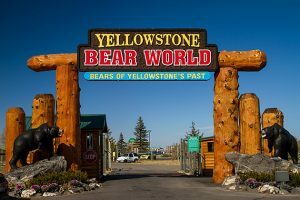 However, unlike a normal zoo, when you get to Bear World, you are paying to drive through the park, where you will see bears come right up to your car, as well as a close up to other wildlife such as moose, buffalo, and elk. Admission price also lets you go through the petting zoo, which is a fun, and very random, petting zoo, from different kinds of birds, goats, sheep and a pig or two. Another stand out part of Bear World, for an extra fee, is that you can take Curator Tours and do Bottle Feedings of the baby cubs. The Curator Tour gets you and your family up close and personal with the Rocky Mountain Elk, American Bison, Grizzly Bears and Black Bears. People tend to choose this option if they want to get closer pictures of the wildlife. This is, also, the only way you can feed the adult bears at Bear World. Up to three times per day, children and adults have the opportunity to help the Bear World staff in feeding the bear cubs. This gives you an awesome, up close and personal, experience, as you get to feed the bears and pet, and hold, the baby bear cubs. They take you behind the scenes on this tour and you get to see how it is all run from behind the scenes. As this is the most popular part of Bear World, it is something that you need pay for in advance, so you know you will have a spot to go and see the baby cubs. One of the other parts of Bear World, that is a great part for the kids, are the amusement rides. The rides are specifically designed for children ages three and up. These rides are included in your admission ticket. There is a fun Circus Train, the Bear Affair, and a Log Roll’r Coaster. These rides can be enjoyed by all in your party. 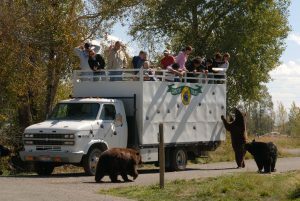 Not only does Bear World accommodate cars and pickups, they are also wiling to let travel trailers, motor homes and tour buses go through the park. This is great if you are with a touring company, or you need a quick break, find yourself on Highway 20 between Rigby and Rexburg, from traveling in your motor home. During times of operation, as the park and it’s inhabitants go into hibernation, the hours of the park are 9 to 5 and they are open 7 days a week. This park shuts down towards the end of October, so make sure that you take advantage of getting over to Bear World as soon as possible, to enjoy the wonderful look of Idaho.